The stage and screen actress is currently starring in The Good Fight following seven years in the same role of Diane Lockhart in The Good Wife. Baranski made her Broadway debut in Hide & Seek in 1980. For her next Broadway performance, in Tom Stoppard's The Real Thing, she won the 1984 Tony Award for Best Featured Actress in a Play. Other Broadway credits include The House of Blue Leaves, Rumors (for which she won her second Tony) and Nick & Nora. At the Kennedy Center in Washington, D.C., Baranski starred in Sweeney Todd in 2002 (for which she won the 2003 Helen Hayes Award for Outstanding Actress in a Musical). In film, some of Baranski’s better known roles are as Katherine Archer in The Birdcage, Mary Sunshine in the musical Chicago, Martha May Whovier in How the Grinch Stole Christmas, Connie Chasseur in The Ref and Tanya Chisham-Leigh in the hit musical Mamma Mia! She also played Cinderella's stepmother in the film adaptation of the musical Into the Woods. Baranski was featured as Cybill Shepherd's sarcastic, hard-drinking friend Maryanne Thorpe in the CBS sitcom Cybill (1995-1998), for which she won an Emmy Award as Best Supporting Actress in a Comedy Series along with three other nominations. She has guest starred in several episodes of The Big Bang Theory, for which she has received two Emmy nominations. From 2009 to 2016, Baranski played the role of Lockhart, a top litigator and senior partner of a Chicago law firm on the CBS series The Good Wife. For the first six seasons of the series, she was nominated for Outstanding Supporting Actress in a Drama Series. In the series’ spinoff, The Good Fight, which began airing on CBS and then CBS All Access in February 2017, her character joins another law firm after being forced to return to work. The Scottish-born American musician was the founding member, principal songwriter and lead singer and guitarist of the American new wave band Talking Heads, active between 1975 and 1991. A multi-instrumentalist, Byrne is known for his distinctive voice. He has released his own solo recordings and worked with various media, including film, photography, opera, fiction and non-fiction. He has received Oscar, Grammy, and Golden Globe awards. Byrne started his musical career in a high school band in Baltimore, where his family had moved when he was 8 or 9. In 1974, Byrne moved to New York City and founded Talking Heads with Chris Frantz and Tina Weymouth, later joined by Jerry Harrison. The band released eight studio albums before going into hiatus in 1988 and was inducted into the Rock and Roll Hall of Fame in 2002, when they reunited to play four tracks, including "Psycho Killer" and "Burning Down the House." During his time in the band, Byrne took on outside projects, collaborating with Brian Eno during 1979 and 1981 on the album My Life in the Bush of Ghosts, which attracted considerable critical acclaim due to its early use of analogue sampling and found sounds. Rei Momo (1989) was the first solo album by Byrne after leaving Talking Heads, and features mainly Afro-Cuban, Afro-Hispanic and Brazilian song styles. His third solo album, Uh-Oh (1992), featured a brass section, while his fourth solo album, titled David Byrne (1994), was a more proper rock record, with "Angels" and "Back in the Box" as its two main singles. For his fifth studio effort, the emotional Feelings (1997), Byrne employed a brass orchestra, and Look into the Eyeball (2001) continued the same musical exploration. Grown Backwards (2004) used orchestral string arrangements and includes two operatic arias. In 2008, Byrne and Eno reunited for his eighth album, Everything That Happens Will Happen Today. Byrne has also worked in theater and film. In 1981, he partnered with choreographer Twyla Tharp for a ballet, The Catherine Wheel. In 1991, he released a classical instrumental album, The Forest. His work has been extensively used in film soundtracks, most notably on Bernardo Bertolucci's The Last Emperor, which won an Academy Award for Best Original Score. In 2008, Byrne released Big Love: Hymnal, his soundtrack to season two of the HBO TV series Big Love. He and Eno provided the soundtrack for the film Wall Street: Money Never Sleeps. In 1990, Byrne founded the world music record label Luaka Bop, which includes music from Cuba, Africa, the Far East and beyond. 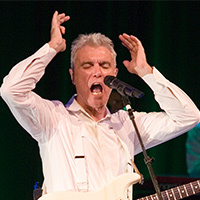 In 2005, Byrne started his own internet radio station, Radio David Byrne. In addition to his other endeavors, he is known for his activism in supporting cycling and for using a bike as his main means of transport throughout his life, especially around New York. The country music singer, songwriter, actor and producer is known as the "King of Country" and is considered one of the most influential and popular recording artists of all time. Strait is known for his neotraditionalist country style and cowboy look, and for being one of the first and main country artists to bring country music back to its roots and away from the pop country era in the 1980s. He has sold more than 100 million records worldwide, making him one of the best-selling music artists of all time, including 13 multi-platinum, 33 platinum and 38 gold albums. His best-selling album is Pure Country (1992), which sold 6 million copies. Strait’s success began when his first single "Unwound" was a hit in 1981. During the 1980s, seven of his albums reached No. 1 on the country charts. 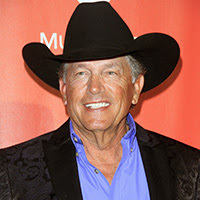 In the 2000s, Strait was named Artist of the Decade by the Academy of Country Music, was elected into the Country Music Hall of Fame and won his first Grammy award for the album Troubadour. In 1989, 1990 and 2013, he was named Country Music Association (CMA) Entertainer of the Year, and Academy of Country Music (ACM) Entertainer of the Year in 1990 and 2014. He has been nominated for more CMA and ACM awards and has more wins in both categories than any other artist. In 2009, Strait broke Conway Twitty's previous record for the most No. 1 hits on Billboard's Hot Country Songs chart when his 45 No. 1 singles surpassed Twitty's 40. Counting all music charts, Strait has amassed a total of 61 No. 1 hits, breaking a record also previously set by Twitty, and giving him more No. 1 songs than any other artist in any genre of music. Strait is also known for his touring career when he designed a 360- degree configuration and introduced festival style tours. FAMOUS & 65 is a featured article in the Senior Spirit newsletter.